Venezuelan President Hugo Chavez and two of his regional proteges are rewriting their nations' constitutions, following a Latin American tradition of using the fundamental charter to attempt radical breaks from past regimes. Venezuela, Ecuador and Bolivia are promoting constitutional reforms as ways to root out corruption, redistribute wealth to the poor, and in the case of Bolivia, reverse centuries of discrimination against an Indian majority. But opponents call them bald-faced power grabs by leftist presidents seeking to crown themselves with limitless authority. "The impression is that little emperors are being formed in the Andes with excessive power in the executive branch," said Luis Verdesoto, a political scientist in Quito. A special assembly convenes Thursday to draft a new Ecuadoran constitution, the country's 20th since declaring independence from Spain 195 years ago. President Rafael Correa has promised a document that will wrest power from the country's traditional political parties, which many Ecuadorans blame for their chronically unstable nation's ills. In Bolivia, a rump constitutional assembly - all but three opposition delegates boycotted the vote - approved a framework for a new constitution over the weekend. It would allow the president unlimited re-election and gives central authorities greater control over spending at the expense of state governments. And on Sunday, Venezuelans vote on 69 amendments that will give Chavez even more power to remake the oil-rich nation into a socialist state. If approved, Chavez, 53, would be able run for re-election indefinitely, and presidential recalls will be more difficult. Chavez also would be able to redraw political districts, and declare indefinite states of emergency during which he can suspend certain civil liberties and censor the media. While opponents have taken to the streets, the promised changes also have generated huge expectations as the presidents promise to use expanded powers to improve the lot of the long-neglected poor. Including people who haven't benefited from Latin America's shift from right-wing dictatorships to democracies is a constant theme for Chavez, Correa and Bolivian President Evo Morales. But these new constitutions risk "personalizing too much power, which instead of consolidating democracy, weakens it," said Marta Lagos, who directs Corporacion Latinobarometro, a Chile-based regional polling organization. 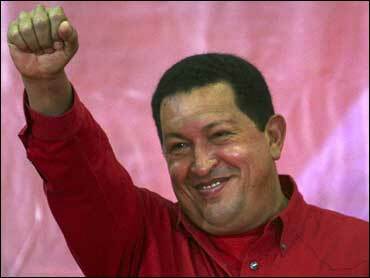 Chavez has certainly personalized Sunday's referendum, making it an us-against-them proposition. "He who says he supports Chavez but votes 'no' is a traitor, a true traitor," he said in a campaign appearance. "He's against me, against the revolution and against the people." Chavez has no guarantee of victory on Sunday - a poll published last week showed 49 percent of likely voters opposed Venezuela's constitutional reforms, ahead of the 39 percent who favored the changes. The polling firm Datanalisis surveyed 1,854 Venezuelans and the poll had a margin of error of 2.5 percentage points. The government has cited other polls showing Chavez in the lead. The latest developments in Bolivia also could backfire on Morales. The constitutional assembly had to convene in a military garrison amid riots by opponents who say the new charter will benefit indigenous groups at the expense of regions led by his opponents. Many fear a new constitution approved by the indigenous majority will tear the divided nation apart. Unlike Morales, Ecuador's Correa will have an ample majority - 80 of the 130 seats - in the country's constitutional assembly. The assembly convening Thursday will meet for six months, a period that can be extended by two months. The final text needs approval in a national referendum. Correa, 44, is Ecuador's eighth president in a decade. He says the new charter will make politicians more accountable, including allowing the recall of elected officials, and will expand government control over Ecuador's free-market economy. His opponents say his true intention is to concentrate power in the presidency. But 82 percent of the voters, disgusted with deeply rooted corruption and greed among the political elite, supported Correa's call for the assembly. In its first act, the assembly is expected to order the opposition-dominated Congress into recess and replace it with a commission that will legislate until a new charter is approved and general elections called. "Congress is closed only in a dictatorship," bemoaned opposition congressman Carlos Gonzalez.